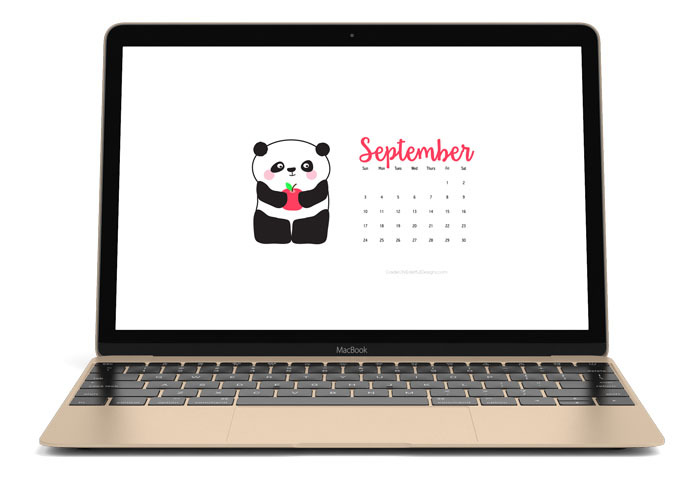 I have a super cute panda September 2017 Calendar Wallpaper for you. I made this little panda a couple of months ago when I was reviewing the book, Please, Mr. Panda, on Grade ONEderful. Although, instead of doughnuts, I put an apple in his hand because school in Canada begins in 6 more days! 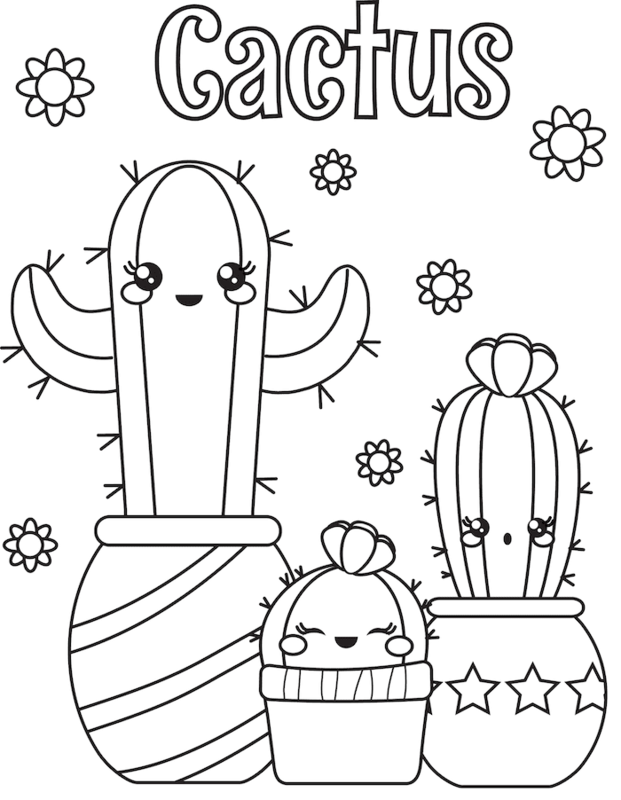 Cactus Coloring Page for Kids: It's Free! 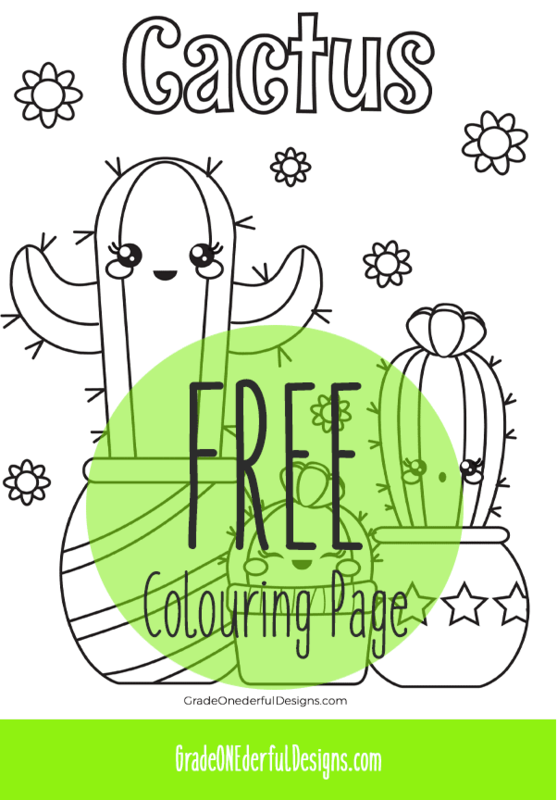 I have a cute cactus colouring page for you and your kids. You're very welcome to use this at home or in the classroom (personal use only). If you haven't seen them yet I also have some kawaii cactus clipart for sale ($3) which includes a free cactus paper. 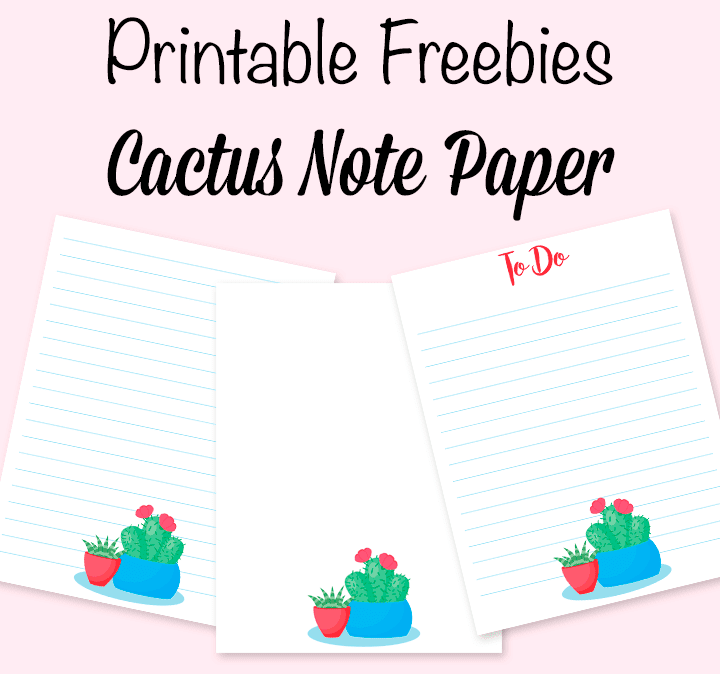 You can also grab some cactus note paper for free! If you'd like a set of cactus paper I have that, too, in both my shops. On my other blog, Grade Onederful, I just posted a quick little round-up of some fiction books featuring the sweetest little cactus characters. Be sure to pop over and have a look. That's it! Please stop by in a couple of days for more freebies. 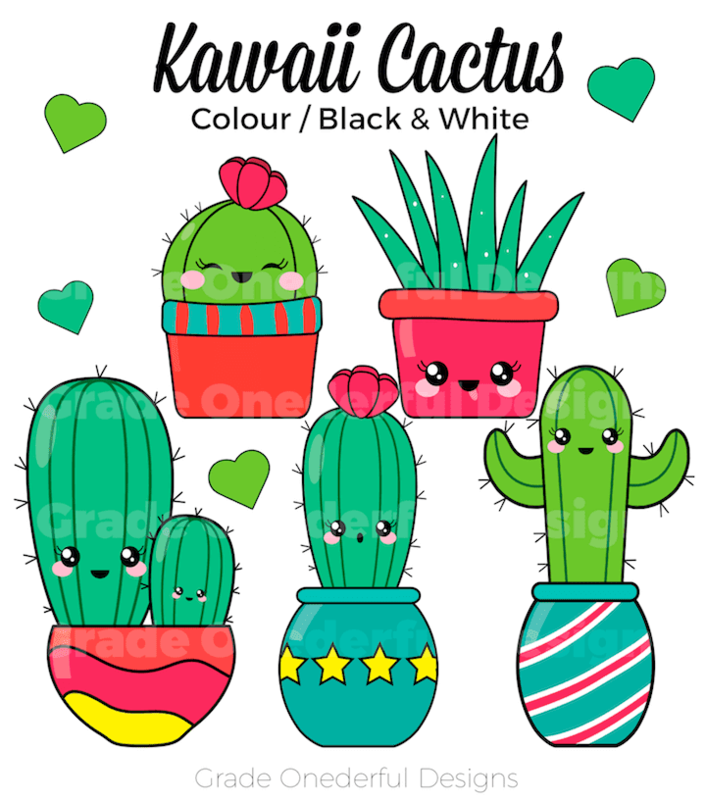 I've been making kawaii cactus clipart all weekend long. Have a look! As you can see, I made 5 totally adorable cacti in a variety of colorful pots. I've also included the cacti in black and white. As a bonus you get some cute little hearts and two digital sheets of cactus paper. The cacti are excellent for posters, products, stickers, calendars, colouring books and more. If you purchase the kawaii cactus you will receive 15 separate elements in one zip file. Each image is a high quality 300 dpi png file. Cactus papers are 8.5 X 11 inches and 12 X 12 inches. 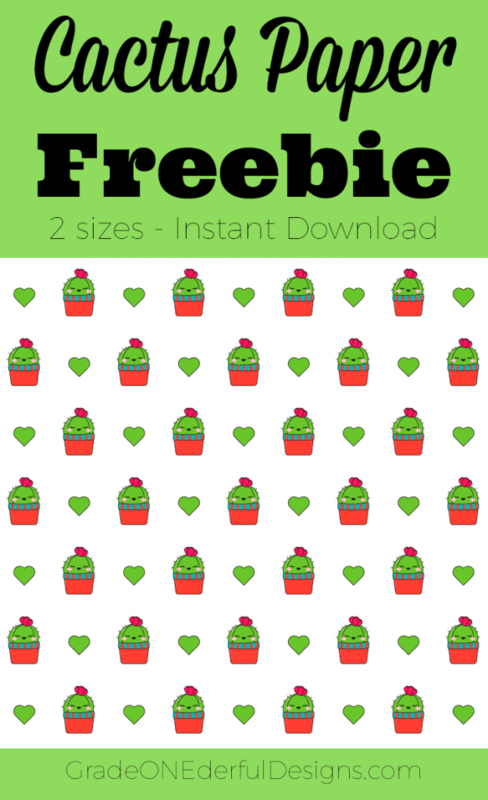 I promised you a cactus paper FREEBIE and here it is. Both sizes, 8.5 X 11 and 12 X 12 inches. The free paper is for personal use only, though if you purchase the whole set you can use them for small commercial. 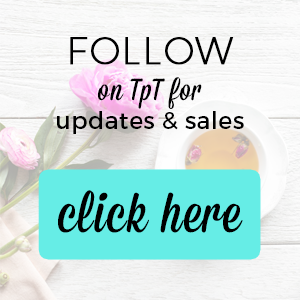 If you love this freebie, be sure join my newsletter for all post, freebies and product updates! 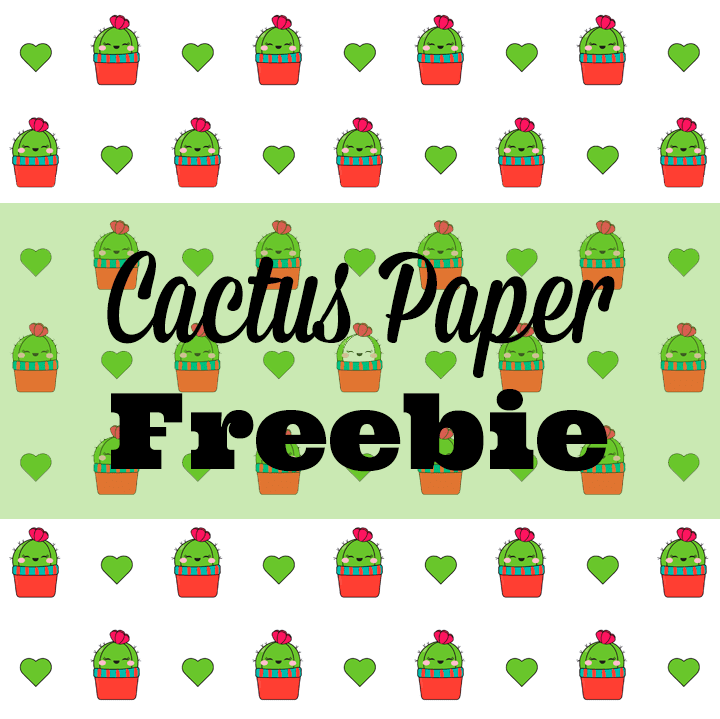 Did you grab last week's free cactus note paper? It's not kawaii, but it's adorable. It's cute, it's free and you can download it here. It seems everywhere I look these days I'm seeing cactus motifs and I love 'em. They're on mugs, quotes, t-shirts, you name it. So I decided to make this cactus note paper. You have a choice of three different styles. A blank page, a lined page, and a page with "To Do" at the top. You could use these to write someone a letter or to jot notes on at home or at school. You could also easily customize the blank note paper by pasting into power point, Pic Monkey or Canva and adding whatever you like ~ perhaps some text so you could use it as a binder cover! You can find more FREE GOODIES here. Thanks for stopping by! If you like my printables be sure to follow for updates. Free envelope template PLUS some pretty polka dot digital paper. This beautiful envelope is super simple to make using my template and pretty paper. All you need to do is print the paper (8 1/2 by 11 inches) then flip it over and print the template on the other side. Cut on the dark lines, fold on the dotted lines, glue the bottom and voila! Polka dot goodness. The finished size is 5 1/2 inches wide by 4 1/4 inches tall. You only need to add a white label to the front of the envelope to address it, and you're good to go. 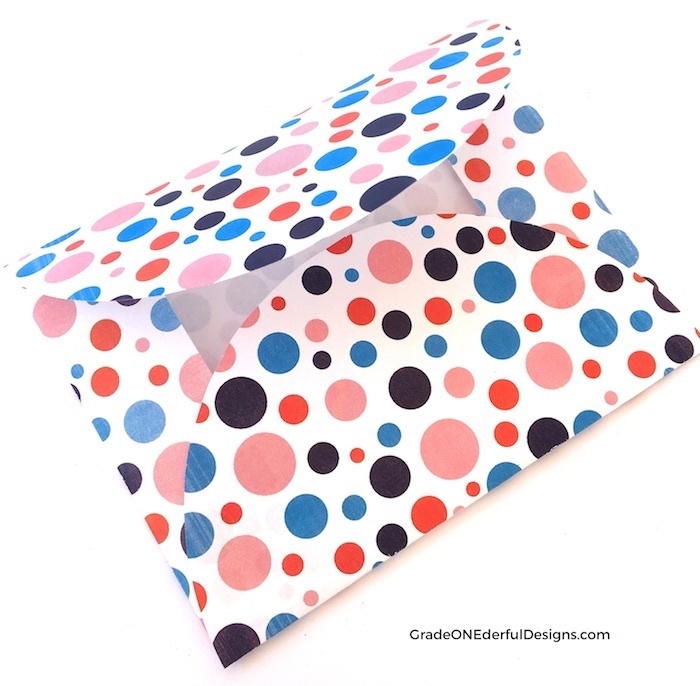 And of course, if the polka dots aren't your thing, the envelope will look amazing in any coloured or scrapbook paper you happen to have on hand. Please remember, these are for personal use only. Thank you! You might also like this very sweet Valentine paper or these pretty papers. They'd all make great envelopes!